Hi, does anyone know how to write text to the game window in some way? Like showing a score counter in the corner, or making a screen with "Game over, your score was: x" or something. You are looking for the Console::log("score: %d",score); command. For the formatting of variables, look up the C++ printf command. 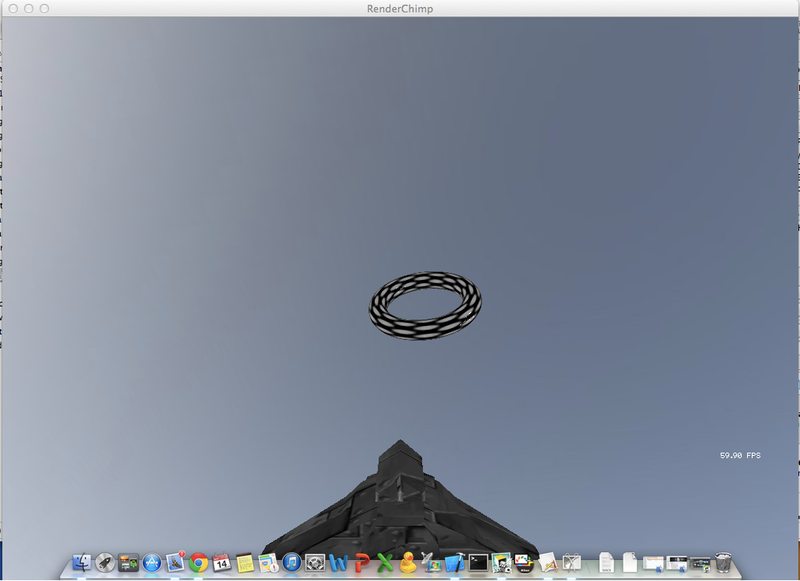 We are the team Rodrigo Daguano and Sandy Espinasse, and we created the game Awesome Torus Ride! Your goal is to pass a fixed number of Tori as fast as possible. You can control your spaceship with the AWSD, + QE for spinning left/right. Also you can accelerate with Z, and brake with C.
Your time will start counting when you press one of these movement keys. The Tori are randomly positioned along the path and you must cross their centers precisely in order to get them scored. If you miss one the you can always return, the clock will not stop, but you are losing valuable seconds! Circle ring destroyer by Nguyen Lam & Shan Senanayake: The objective is to destroy circle rings by using a ball to bounce of the sphere you are controlling. Controls: A or D to move left and right. 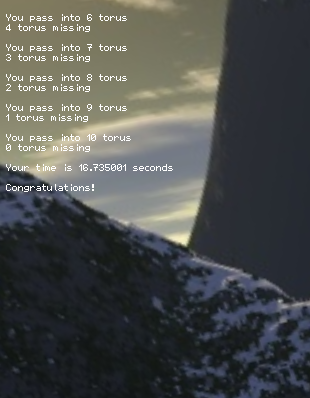 Our game is called The Best Torus Game Out There. Our group is David Scheibe and Kenan Sadik Sulejmanovic. 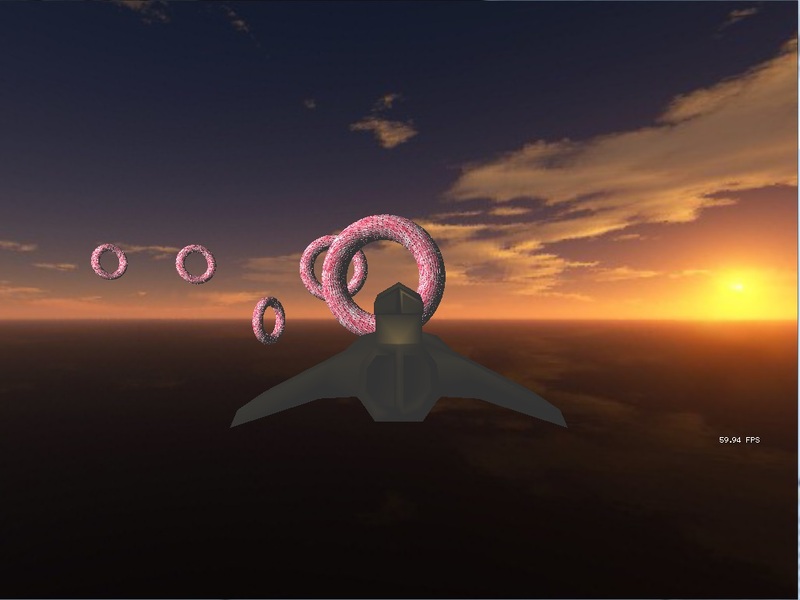 The goal of the game is to fly through a set number of torus's as fast as possible. They are randomly placed and you won't know where the next one is until you pass through the previous torus. You have to hit the center of the torus (without hitting the torus itself) to move on to the next one. Once you finish, your time will be displayed. W to accelerate, S to decelerate and mouse to control direction. Avoid getting hit by asteroids and earths and collect more shiny donuts than your opponent. Title: Whack the Seal, to Seal your Destiny! Controls: Use WAD, to control your seal, and P to Pause the game (although you may have troubles unpausing it... :p (it's a feature ))! Objective: Seals don't like to be hit by various object such as Maces and Baseballbats! Avoid these!!! But as everyone knows, they love My Little Ponies . So collect these to get points . Drive the Hover Tank and shoot down the EDA221-themed balloon targets as fast as possible. Control the tank with [ W ] [ A ] [ S ] [ D ] and steer the turret with the mouse. [ MOUSE BUTTON 1 ] to fire and [ MOUSE BUTTON 2 ] to reset the view. Run RenderChimp.exe in win32\bin\ . Our game is called "Destroyer of Earth(s)". In this game you steer a small spaceship whose evil pilot wants to destroy all existing life in the whole universe (except himself of course). The player loses points when crashing into Earth(s) without an activated shield. 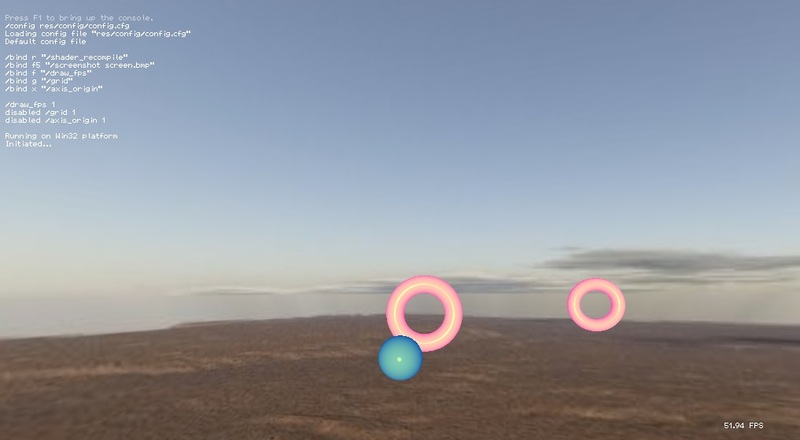 The player gains points when destroying an Earth. Steer the spaceship with AD and try to avoid the asteroids. You get points for every asteroid avoided but beware that you lose points for every collision with an asteroid. The camera will also shake each time you hit an asteroid to indicate that a collision have occured. 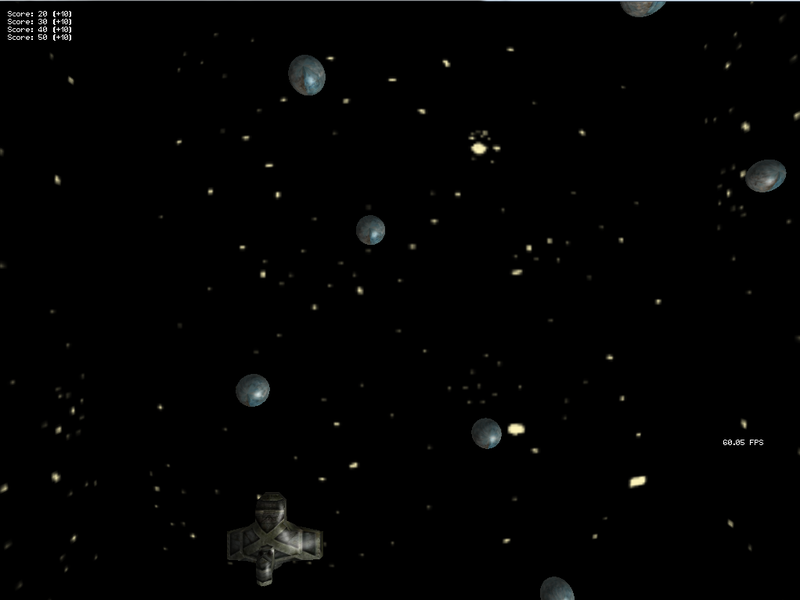 The speed of the game and the number of asteroids increase with the score and decrease with each collision. Fly through the polkagris donuts! Fly through the polkagris donuts in the right order for the rest of your days! "W" for flying forward and "S" for backward. Click and hold right-mouse button to stear. 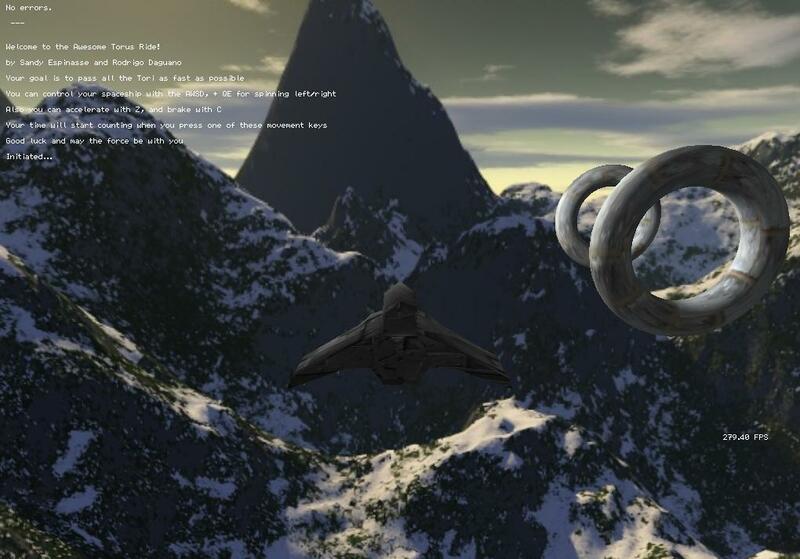 Fly around in the air and shoot down the asteroids, who are out to kill you. "WASD" for moving the plane around, "OP" for accelerating and deaccelerating, "SPACE" for shooting. Go through as many tori as you can manage. If you hit one you are dead. The only thing you can change is your speed. It's flappy bird hard. 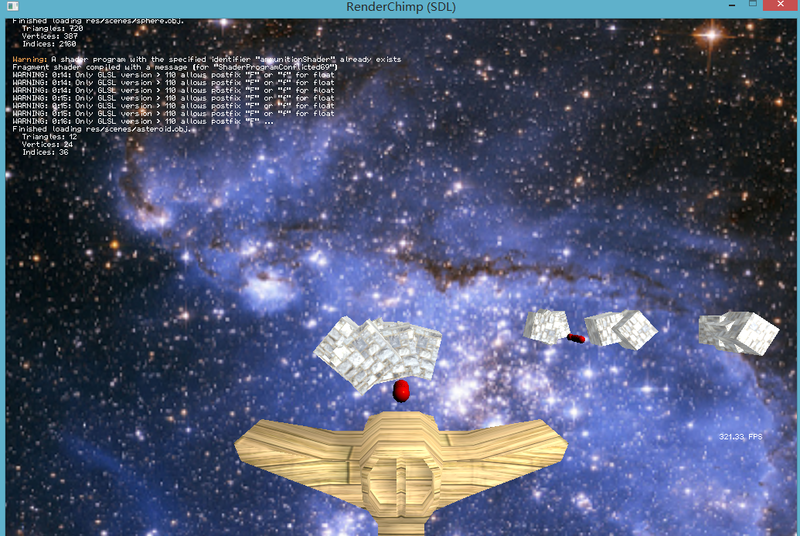 Features: brilliant collision detection on the two sides of rotating tori, cubemapping, interpolation and phong shading. 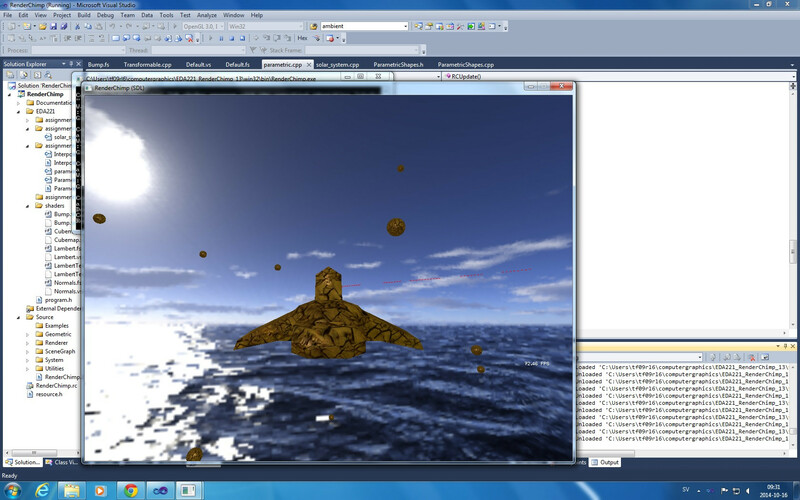 While out flying with your spaceship (as you do), you get trapped on a mysterious island. 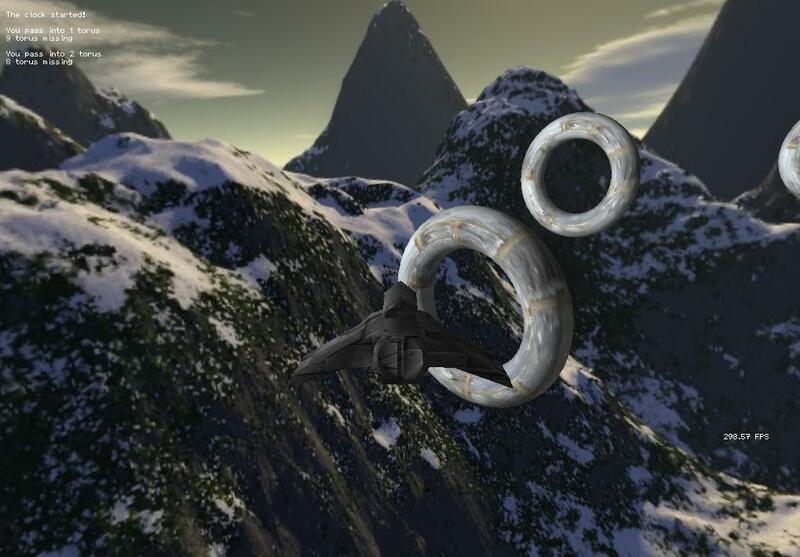 The giant stone ogre presiding over the barren land tells you the only way to escape the island is by flying perfectly through the stone arches surrounding the island. When you pass through an arch, it turns red, to mark you success. Use the A and D keys to navigate your ship.